I currently live in Karenni Refugee Camp 1 with my sister but I come from Shadaw. I came to camp in 2009 because there were many problems in my community and I wanted to study. My father passed away in 2010 because of alcohol. Inside Karenni State, we were unable to make a living or farm. Fighting often occurred in my village in Shadaw. I couldn’t understand about this because I was too young. We always hid in bunkers that we dug under our houses. I was not afraid. I always believed that when I became an adult, I would be a Karenni soldier and fight back against the Burmese soldiers. The Burmese soldiers beat our community leaders. Many people moved to the refugee Camps like me. We could not face this discrimination. I decided to study at SDC because we have no human rights in my village. Therefore, I wanted to know about them. I wanted to know why we didn’t have human rights in our community. After studying the SDC Basic Course, I now understand the reason our rights are abused by the Burmese soldiers. The Burmese soldiers are a result of a bad system. We do not have democracy in our country. Therefore, we do not have an avenue to claim our rights. This allows the Burmese soldiers to abuse us and our people to suffer. I feel very happy now I have studied at SDC School because I know about my rights. During my time at SDC School, there was a fire in Karenni Refugee Camp 1. On a day in hot season, an elderly woman in section one left her stove unattended. This caused a serious fire. At that time, I was playing with water for our traditional Kay Htoe Boe festival in section one. When we saw the fire, we tried to pour water on the fire. We couldn’t stop it though because of the wind. It was only a light breeze but the fire was very strong and it spread quickly. After the fire, my house was destroyed. 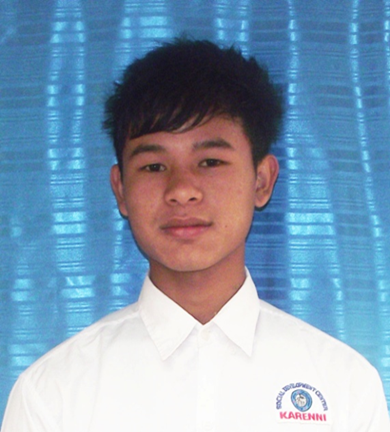 I had to stay at the camp committee office and I worried that I would be unable to study in the summer at SDC School. Luckily, SDC allowed me to stay in their dormitory for the 2015 summer course. After studying at this school and because of my experiences, I want to work for my community. I want everyone to be careful of fire. Please do not allow children to play with fire. In the future, I want to be a leader in my community. I want to distribute medicine in my community. I want to do this because there are not enough people who have completely finished school. Finally, I want to say that the subjects such as human rights, law and democracy are really useful for me. I don’t want to see my community collapse. SDC School is very important for our future. SDC School saves our lives.